We’ve been driving around the area for a day or two, and I discovered something odd. 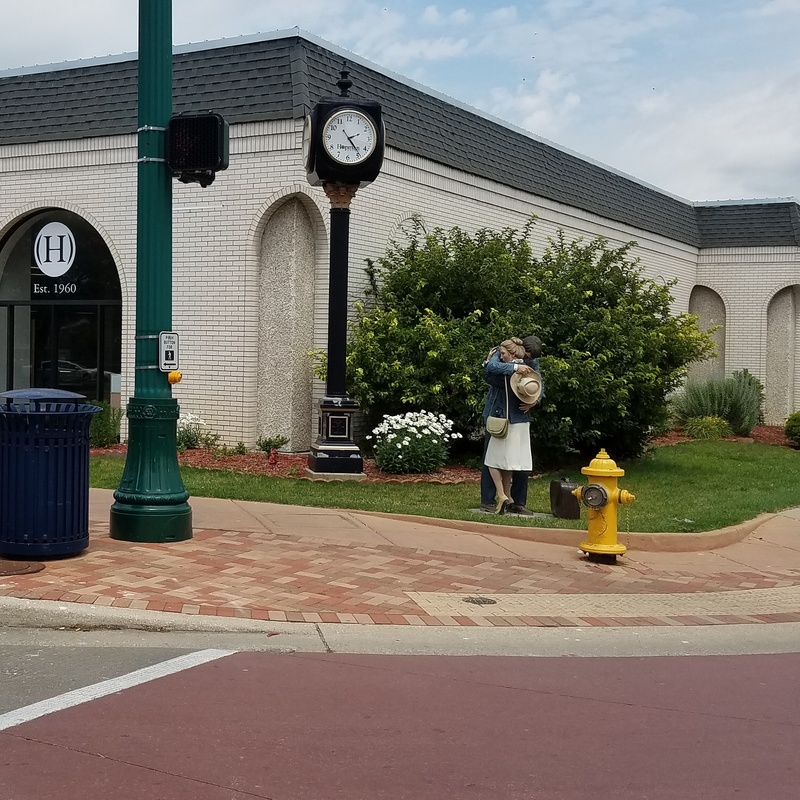 Both the city of Elkhart and the city of Middlebury in Indiana have very life-like statues doing everyday things sprinkled through town. It took a couple of passes before I realized that they even were statues! At first I thought they were pretty cute, but the more I spotted the more they bothered me. Trish thinks they’re cool. There are several more pics posted in the 2oldchicksrv Instagram account. There were many more statues, these are just what I could get without stopping traffic! The next few days are the ‘sprint’ portion of the trip. We’ll be making a full out push to arrive at Devil’s Tower by the 4th of July. Why? So we can watch the fireworks over that famous formation and pretend we’re experiencing a ‘Close Encounter’ of course! Last night I fell asleep right in the middle of thinking that I was going to have a hard time falling asleep. And I slept like a rock all night. I know you all worried about that, so I thought I’d get that covered right away. The plan for today was to get up, get out, get gas and go to the RV and MH Hall of Fame. And all of that happened. Eventually. We did get up and out at a reasonable hour. The rest area we camped at no longer has fuel service. Either they are replacing all of the tanks or replacing all of the pumps, it was hard to tell. But we had to move another 30 or 40 miles down the road to get to the next area with gasoline service. No problem! We get there in due time. There is no line, just one guy at the furthest pump in our chosen lane. He’s clearly been pumping gas for a little bit already, and it takes a fair amount of time to fill our tanks so we’re still doing well. Until his mind wanders and he starts flooding the area around his car (and ours) with gas. Trish alerts him to the problem. His only response was “Well it didn’t click. It’s supposed to click when the tank is full.” He just wipes the gas from the side of his car and drives away, leaving a good-sized puddle of gas on the ground in front of us. Trish alerts the attendant, who wanders out, puts little orange cones right in front of us and dusts the absorbent over the puddle. Leaving us to figure out how to get around this new obstacle. Because there are a few hard rules about towing a car with all 4 wheels on the ground. Number one is you can’t back up. Ever. For any reason. Because bad things will happen to your vehicles. But Trish manages to get us out of there and we hit the highway again. I should mention that one of the things I do to keep myself entertained on road trips is count stuff. And I don’t count white cars or VWs. On a trip to Amelia Island, I counted the number of Cracker Barrels available at the exits. (It’s around 27, I think). On the way back I counted Waffle Houses. (Only 18) This trip I have been counting highway work areas, by state. It’s early in the race yet, but Ohio is well in the lead by having 9 separate work areas. Some last for miles. Many seem to require losing lanes, and we all know how that works. The result is that we did not progress as quickly as we had estimated. But no worries, the museum is open until 5 and we’ll be fine. So when the highway traffic splits to two one lane sides due to yet another work area and we had to choose a side, there was no stress in our hearts. It’s easy to deal with traffic delays when you carry your own bathroom and kitchen with you. But we maintain a respectable 20 miles per hour in our lane, driving past mile after mile of the other lane just sitting there and we are happy. And eventually it ends and we’re back up to 60. Everyone else was back up to 70 of course, but that’s another rule of flat-towing the car. Max speed while towing is 60. It appears that this is very vexing to all of the cars around us. The truckers appear to be less annoyed, but they all have their own weird company policies to deal with and write it off. Mind you, I have it on good authority that most truckers believe that all RV drivers are idiots. To be fair, they give you the keys to a 20,000 pound vehicle that may be up to 40 feet long and you get no driving instructions at all. So it’s very easy to be an idiot RV driver. But we looked it up on the internet, and YouTube has lots of driving videos. Also, because there are truckers sprinkled though out my family, I know some basic driving courtesies. Most truckers seem to appreciate us using them. And I reciprocate by joining them in thinking that everyone driving a car is an idiot. Case in point. At the toll booth leaving the Ohio turnpike, the gate is not going up for the guy in front in my lane. I did not notice this when I joined the line. After a minute or two, the SUV in front of us starts backing up toward me. I beep, he stops. A minute or two later he starts easing backward again. I beep again, and he keeps easing back. It looks like he, in his cute little SUV, is trying to intimidate me and my 19,000 pounds of fun with his 4 or 5 thousand pounds. But as I mentioned earlier, we just cannot back up. So Trish hops out to tell them that we will not be backing up, because we can’t. Whereupon they inform her that this might take up to an hour to resolve (what?! It’s just a malfunctioning toll gate!). Clearly my inability to back up is somehow time-related and we’re just too stupid to know this. When Trish repeats that we cannot back up, the SUV passenger, I kid you not, says that maybe if we just back up slowly it will all work out. Because if you sneak up on it, you can always fool a machine. True fact. Sure enough, while these kind people were educating Trish the toll gate opened and we all moved on. Sadder and wiser, I am sure. And all of these things make very interesting stories, but they all take time. Time that was not in our schedule. Indiana so far has had only one work zone. But what they have that no one else has had so far are accidents. Multiple, everybody in one lane for 5 miles kind of accidents. Which is odd, because route 80 in Indiana is really a horrible road and much of the truck traffic around us in Ohio found other routes to take. Fewer trucks and slower speeds should be safer, but apparently not. We did make it to the RV and MH Hall of Fame before it closed and were able to make a quick trip through the exhibits. We also learned that the ‘MH’ in the name does not stand for ‘Motor Homes’ it stands for ‘Manufactured Housing’. We did not make it to that part, maybe we’ll try again after we complete our Jayco factory tour tomorrow. It is very cool driving through the Elkhart area because something like 90% of all RVs made in America are made right in this little area. We passed by all kinds of very recognizable RV brand names on large buildings today. 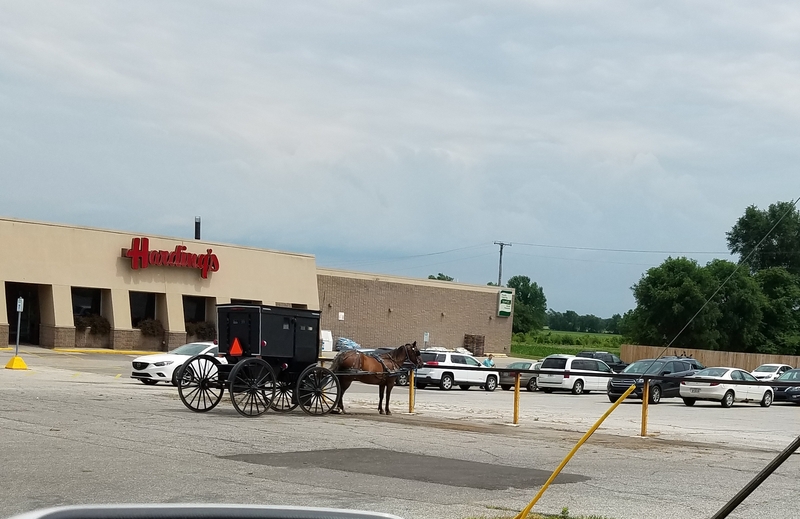 But don’t gawk too much, the roads are also populated by Mennonite horse and buggies. All properly licensed, of course. Well, it’s been a long day, so good night all! This morning we cleared the last of the food from the fridge, locked the windows and doors, set the alarm and walked away from the house. We actually, really, finally started our long planned adventure! We loaded one dog, one cat and a few bags of last minute ‘oh, we need this’ items into the car. We drove to the garage where the RV is stored, loaded her up and hit the road. We did not run around like maniacs. We enjoyed our coffee, waited for the garbage men to collect the last trash items. We did obsessively check the house to make sure things were unplugged and properly secured before leaving, and I will admit we had to turn the water back on once for just one more trip to the bathroom. But we were not maniacs. So it was noon when we pulled out of the storage lot with Steppenwolf’s ‘Born to Wild’ playing brightly. Unfortunately, it appears that the city of Hanover PA is currently replacing ALL of it’s water lines citywide, making that song a little inappropriate. So we switched to Bob Seger’s ‘Turn the Page’. The soundtrack for our adventure must accurately reflect the action, right? And then we spent the majority of the rest of the day on the Pennsylvania Turnpike. Which has not changed very much since the last time I was on it – lots of roadwork requiring lots of concrete barriers making, the lanes narrow enough to make you squeeze your arms in tight. Fortunately Trish got to drive most of that. She also got to drive through the three tunnels. I spent my time working on a narrow knit scarf. As the navigator, you must be ready at any minute to give a report on the conditions to be found on the passenger side of the RV. The sound of the turn signal is your signal to spring into action, reporting on whether the driver can actually fit the RV and tow car into the space available in the adjoining lane. You also fetch drinks and snacks, have the toll money ready and keep the dog from attacking the nice toll booth lady taking large amounts of cash from you because you are driving something with 4 axels and in the class 3 weight category. I have no idea what a class 3 weight category is, but it’s way more expensive than whatever category a car is in!. Because of your many duties, all knit and crochet projects must be small and easily put aside. There are lots of scarves, washcloths and granny squares in my future. Our first night on the road is being spent at the Portage Service Plaza on the Ohio turnpike. Not parked in with the trucks, although that can be a cool experience. We’re trying something different. Some of the rest areas on the Ohio Turnpike have RV parking sections. We’ve always wanted to try one. For $20 placed in a parking meter like thing, you get a nice double wide spot with an electrical hookup. At the end of the row is a fresh water tap and a dump station. It’s not the Ritz. It isn’t even a KOA highway express. But it is easy and convenient. 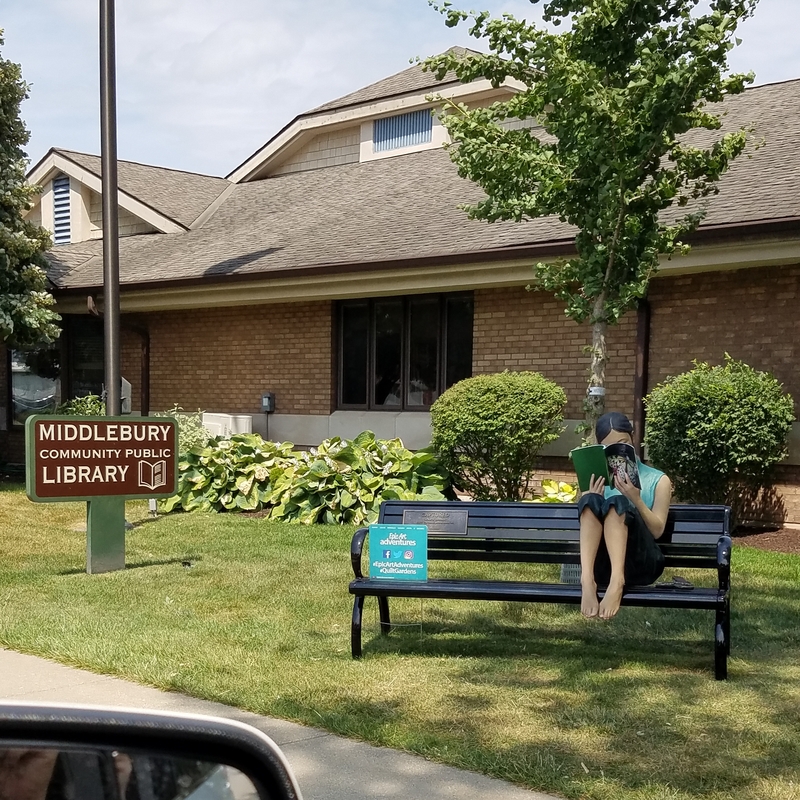 However, now that we’re here I do have one warning – the RV parking area is located RIGHT off of the Ohio Turnpike, and then right off of the truck off ramp to the rest area. And there are a LOT of trucks running through here! I suspect that once I sign off and try to sleep, they will sound even louder than they do now. But that means nothing – we have set out on a great adventure today and we can still walk the dog without worrying about bears. Tomorrow – the RV Hall of Fame in Elkhart Indiana! So, we leave in just two weeks. Fourteen days from now Trish and I will grab the pets, lock the doors (and set the alarm for any of you with larcenous minds) climb in our 31 foot RV and start driving. We’ll drive 14,000 miles and then we’ll be home again. Hopefully, with minds blown. This is not a small undertaking. Things need to be done to make this happen. Things need to be done to make sure the RV itself doesn’t break down and nothing we need to function on the RV breaks down (water, electric, heat, etc…). Things need to be done to make sure the pets are allowed into Canada. To make sure WE are allowed into Canada. Family need to be visited and grandchildren hugged. Flat versions of grandchildren collected. And then administrative things, food things, clothing things. ALL THE THINGS! And do you think we could be relied upon to remember all the things? Of course not! So for the last 3 months we have been making lists. Paper lists. Electronic lists. Spreadsheets. At first they were general lists – coach maintenance, medical arrangements, pets. But as time passed, the lists became more specific – AC maintenance, propane system check, vet appointments. item, and then quiz one another at dinner. Frankly, it was very much like work! And then the dreaded checkboxes made an appearance. Then the competition to get the blasted checkboxes checked. Because the RV can only carry so much extra weight by law. It can only tow a vehicle weighing up to the tow capacity of the hitch. Every item is mentally evaluated – can this be left behind if we’re over the weight limits? Would I be forced to choose between home canned applesauce and yarn? Between the cast iron pans and the big coffeepot? I thanked my lucky stars every day for my Kindle, because I would wear the same clothes every day for 4 months before I would go bookless, I don’t care where I go! And did we weigh every item we loaded so we had a running tally? We are devil-may-care explorers, with a curious deliberate blind spot. We waited until today and drove up to the nearest weigh station with pretty much everything we had on those lists loaded into the coach. Aaand… drum roll please… We made it! You know what that means? There’s room for more yarn!